As Dr. Wilson so kindly stated in his last blog post, the Utah group arrived safely at Salt Lake City International Airport on Saturday, June 2. After stopping briefly at a Target to get various essentials, we finished our two-hour drive at Fillmore (see here for how the drive went), the town we will reside in for the next two weeks. We are staying at a KOA Kampsite in some kozy little kabins. After getting acquainted with the campsite layout, we explored some of the finer cuisine options, finally settling on Larry’s Drive-In Diner across the road. Will tried a marshmallow milkshake that gave him enough sugar to power through the jet lag associated with the time zone change. 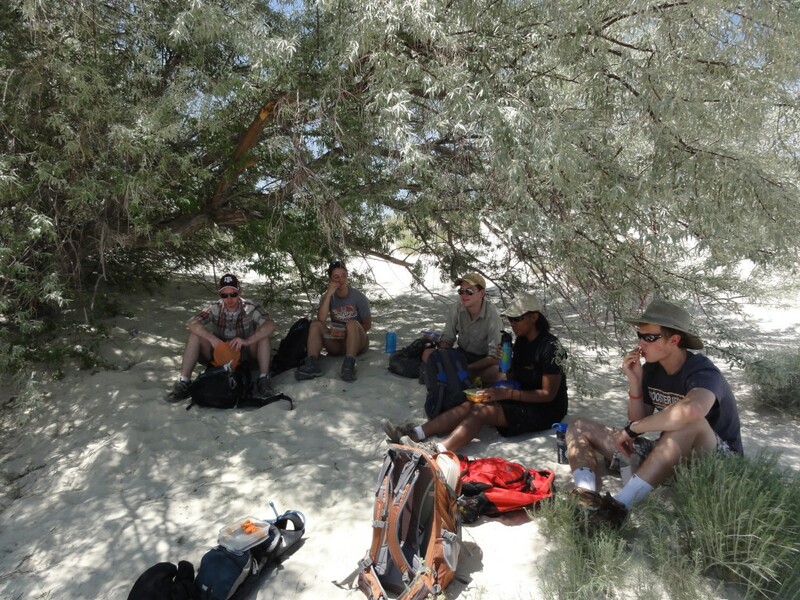 After a filling meal, the group headed back to the campsite for a quick group meeting to go over the schedule for Sunday, which promised to be an orientation day to the Black Rock Desert and what we could expect. Following the meeting, everyone felt the effects of travel and promptly retired to their respective cabins for the evening. Dr. Judge lays out the maps for our field site. The next morning, the group met at 9:30 to pack lunches for the day followed by an overview of equipment and safety precautions that we would need for our fieldwork. With backpacks set up, we gathered as much water as we could carry and set out to our first meeting with the Black Rock Desert. We drove directly west out of Fillmore and, although we couldn’t get onto it, saw Ice Springs, our future field site. We drove around the flow front boundaries and were impressed by how distinct and steep the boundaries actually were. Because today was an orientation day, we set out to find some lava tubes in the Tabernacle Hill lava field. Although we were unsuccessful in locating them, we had some good experience using the GPS units. In addition, we spent a lot of time looking at pressure ridges in the lava field, which adds additional complexity to some students’ projects. Admitting defeat in finding the lava tubes (and questioning the signage that lead us to that area), we drove on to White Mountain, a hulking mass of gypsum sand a few minutes away. Looking for a place to get out of the 93° heat to eat our lunches, we headed to the one tree we had seen in the entire trip. Stepping out of the car almost had us believing we were in the Bahamas, and the white sand proved a pleasant place to sit. 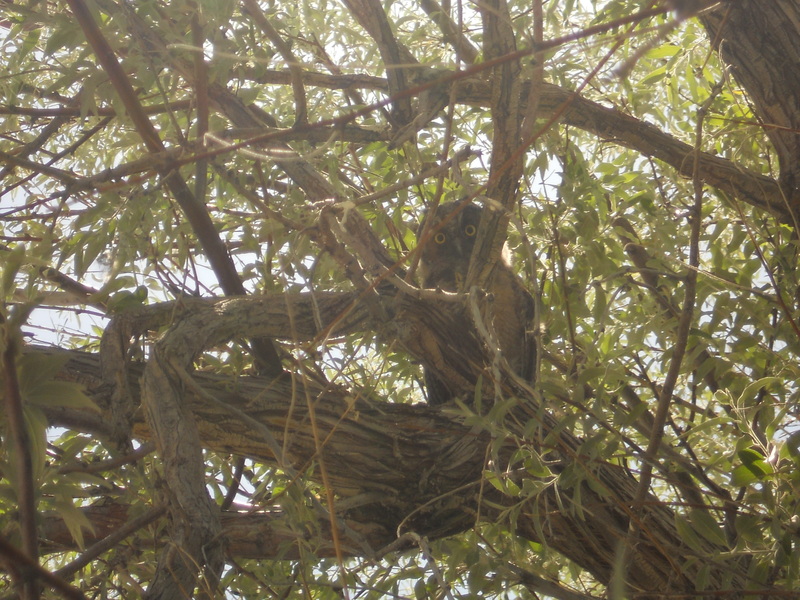 As we moved under the shade of the tree, two small owls flew out from its branches. Waiting cautiously in the leaves above us were three more owls, who seemed upset that we interrupted their lunch with our lunch (3 dead mice taunted them from next to where we were sitting). The glare of someone who's had his lunch interrupted. Imagining we are in the Bahamas. After getting back into the car, we asked Dr. Judge and Dr. Pollock what our next stop would be. Getting only a, “Classified” as a response, all we could do is bounce around in the back of the car down a dusty road. 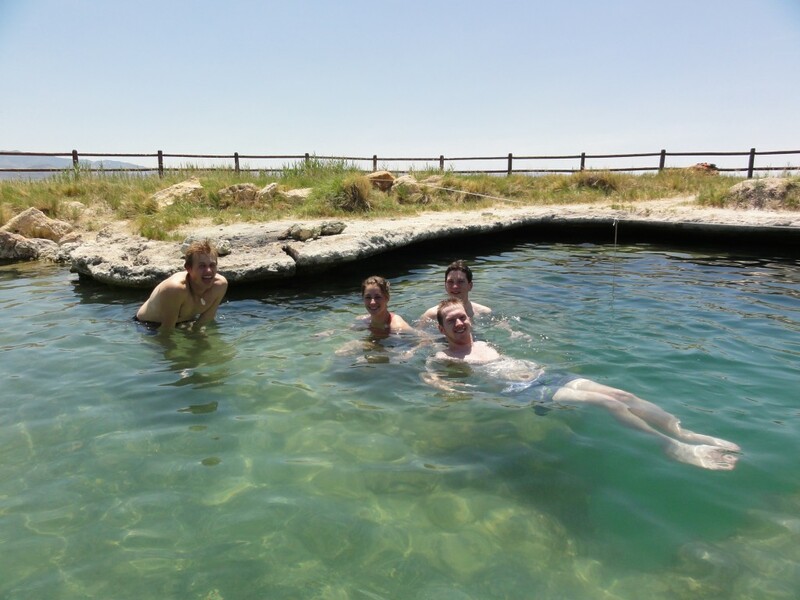 We were pleasantly surprised when the trip ended at a natural hot spring. We eagerly climbed out of the car and jumped in. 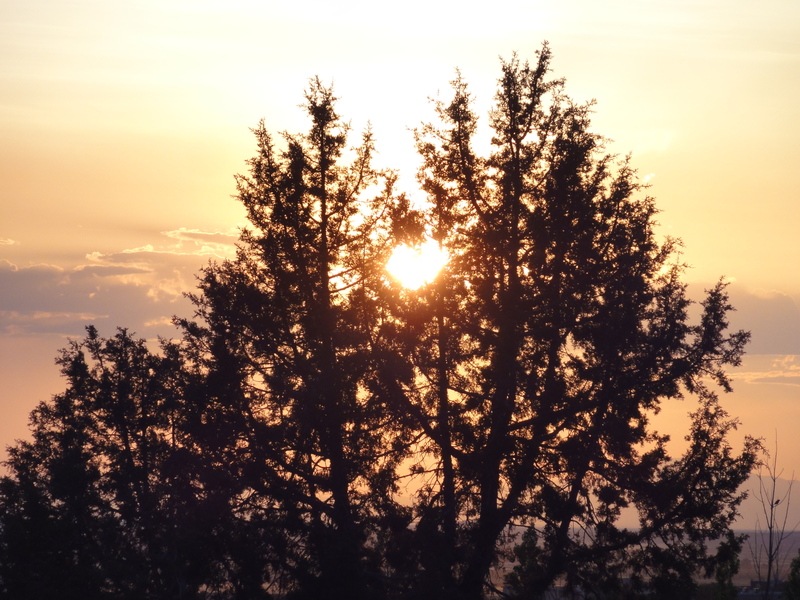 The first day ended with a final meeting back at the campsite to set a schedule for Monday (the 7 am departure time was a harsh return to reality) and a beautiful sunset. The summer field season has started for Wooster geologists. Greg Wiles is now in southern Alaska with his students doing dendrochronology and geomorphology. 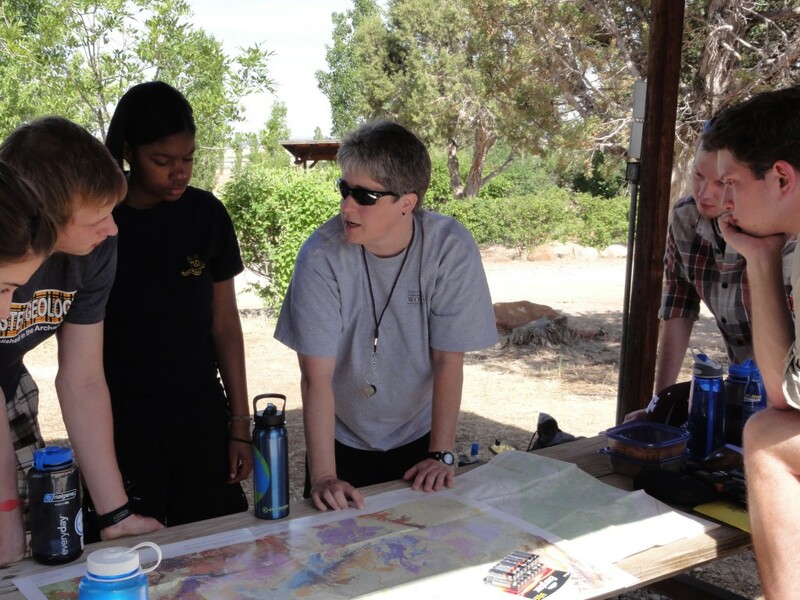 Meagen Pollock and Shelley Judge are running an integrated project in west-central Utah with their students doing structural geology, geochemistry, vulcanism and petrology. Watch these pages for their reports! As for me, I’m on a short vacation. A geologically-rich vacation, of course! My wife Gloria and I are visiting the Shenandoah region of Virginia. We started today in Shenandoah National Park, driving south down Skyline Drive along the Blue Ridge. The weather is spectacular as you can tell from the above image. This is a view near Mile 61 looking west across the Valley and Ridge Province. 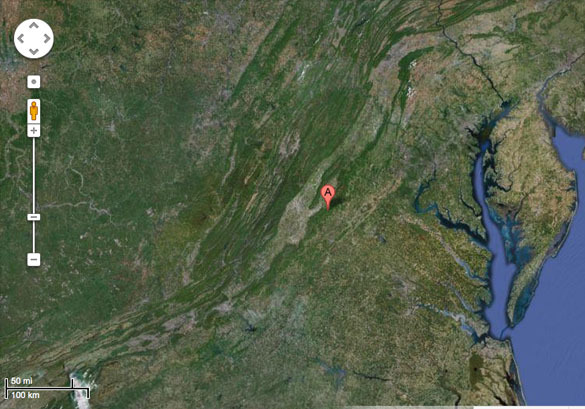 The Blue Ridge Province has a bedrock made of igneous and metamorphic Grenville basement rocks up to a billion years old. 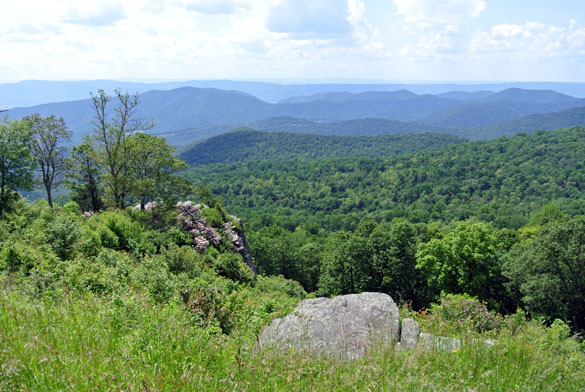 The Blue Ridge itself, which runs north-south from Pennsylvania to Georgia, is mostly an eroded anticline overturned westward. Directly west is the Valley and Ridge Province. In the image above, the “A” is at the spot where the top photograph was taken. You can easily pick out the physiographic and geological provinces. Most of the rocks exposed along Skyline Drive in Shenandoah National Park are metabasalts of the Catoctin Formation (Ediacaran, about 570 million years old). A metabasalt is a basalt that has been metamorphosed (unsurprisingly). The original basalts of the Catoctin were erupted during the rifting open of the Iapetus Ocean, a precursor of the Atlantic. Many of these eruptions were on this early seafloor, forming pillows and thick flows. The total basalts in this formation piled up in layers to almost 800 meters thick. 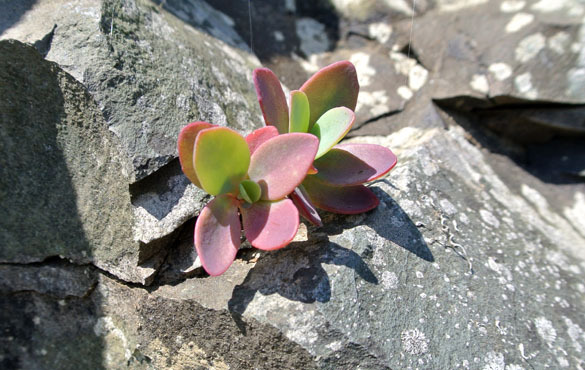 The metabasalt of the Catoctin has a greenish color in many places, giving it the common name “greenstone”. 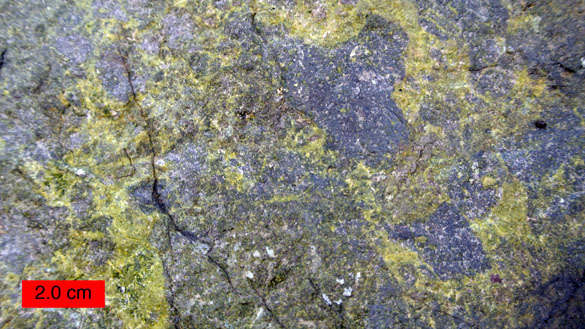 Veins of green minerals, primarily epidote and chlorite, run through the rock, especially in the northern part of the Blue Ridge. This greenstone is occasionally mined to produced chemical-resistant lab surfaces and facing stones. The dramatic geology was accompanied by beautiful wildflowers. 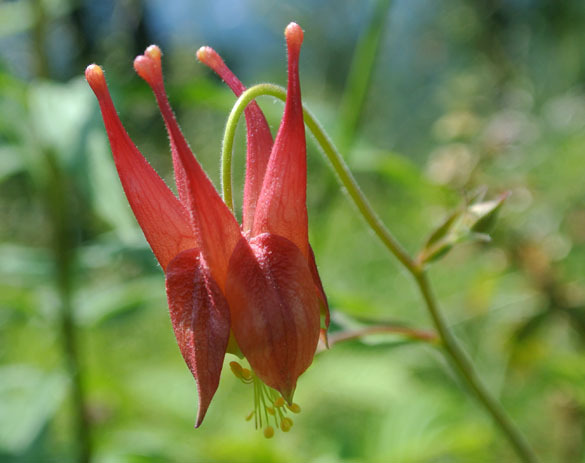 The rocks, flowers, views and weather combined to make an extraordinary day of natural history. Tomorrow we’ll explore how this geology affected human history in very direct ways. Our version above of the bivalve Inoceramus is actually rather small compared to how big it can get. The record holder is a specimen 187 centimeters in diameter (over six feet) in the Geological Museum of Copenhagen. This Wooster Inoceramus is from the Pierre Shale of South Dakota, a unit my colleague Paul Taylor and student John Sime once explored in some detail. 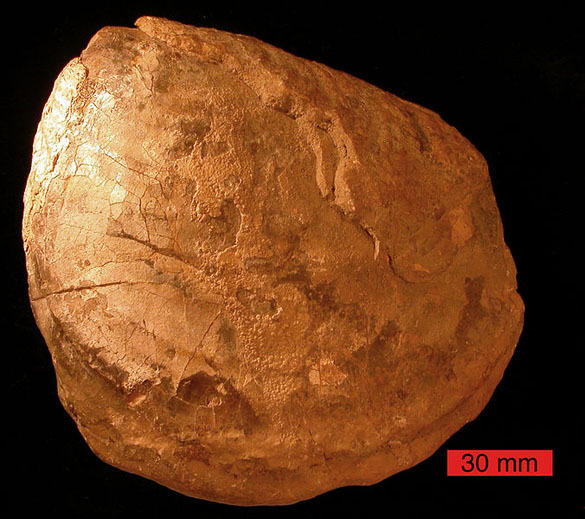 Inoceramus means “strong pot”, which I assume must refer to its unusually thick shell with calcite prisms oriented perpendicular to the surface. They also had concentric “wrinkles” that make them easily identifiable even in small fragments. In fact, we can even recognize the isolated prisms of inoceramids in thin-sections of sedimentary rocks. 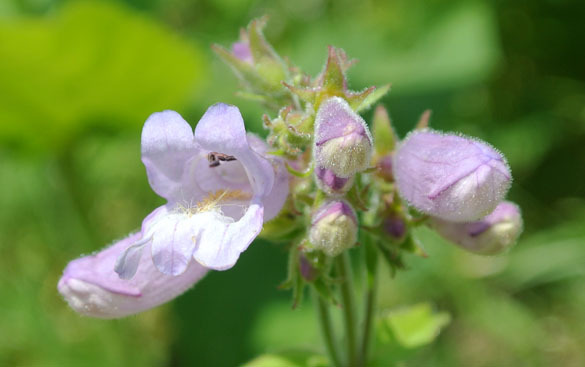 This genus was widespread during the Late Cretaceous, being found from British Columbia to Germany. The had very large gill systems that enabled them to live in poorly-oxygenated waters. 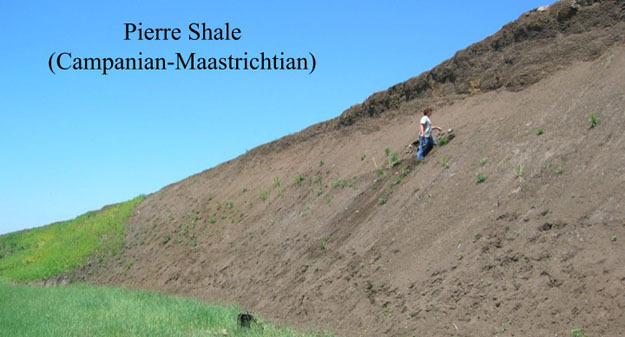 It makes sense that they are so common in the dark, carbon-rich sediments of the Pierre Shale. 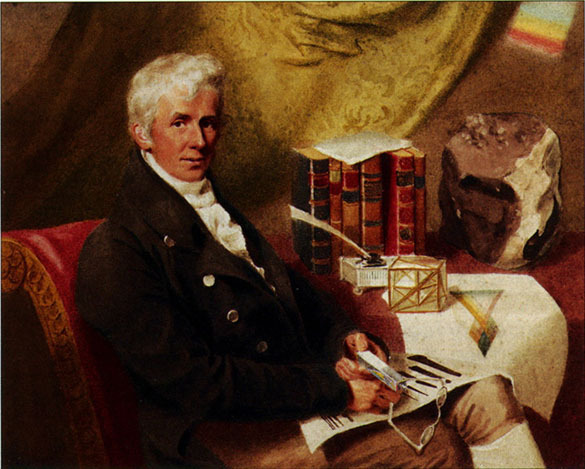 Inoceramus was named by the dapper James Sowerby (above) in 1814, so it is a genus we have known for a very long time. Sowerby (1757-1822) was an Englishman skilled in natural history as well as scientific illustration. He named the first species of the genus as Inoceramus cuvieri to honor the French scientist Georges Cuvier. His illustration of I. cuvieri is below. 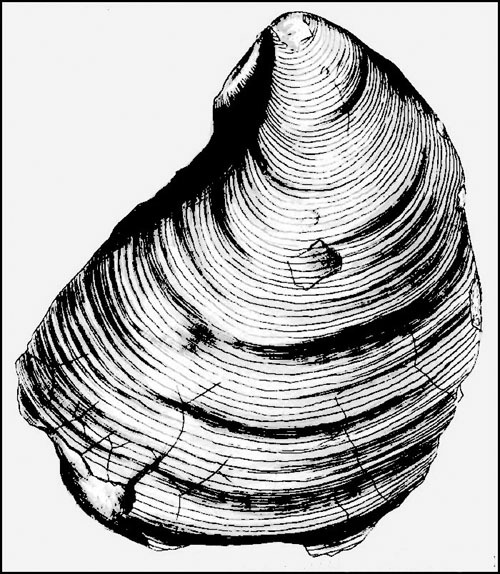 Inoceramus was one of the first invertebrate fossils to be the subject of an evolutionary study in a modern way. Woods (1912) studied various species of Inoceramus in the Cretaceous, noting that it apparently underwent rapid intervals of change. My former student Colin Ozanne and his advisor (and my friend) Peter Harries studied Inoceramus and its relatives in the Western Interior Seaway. Their study, published in 2002, showed that inoceramids were greatly stressed by parasites and predators before their final extinction in the Maastrichtian. Ozanne, C.R and Harries, P.J. 2002. Role of predation and parasitism in the extinction of the inoceramid bivalves: an evaluation. Lethaia 35: 1–19. Sowerby, J. 1822. On a fossil shell of a fibrous structure, the fragments of which occur abundantly in the chalk strata and in the flints accompanying it. Transactions of the Linnean Society of London XIII: 453-458. Plate XXV. Woods, H. 1912. The evolution of Inoceramus in the Cretaceous Period. Quarterly Journal of the Geological Society 68: 1-20.